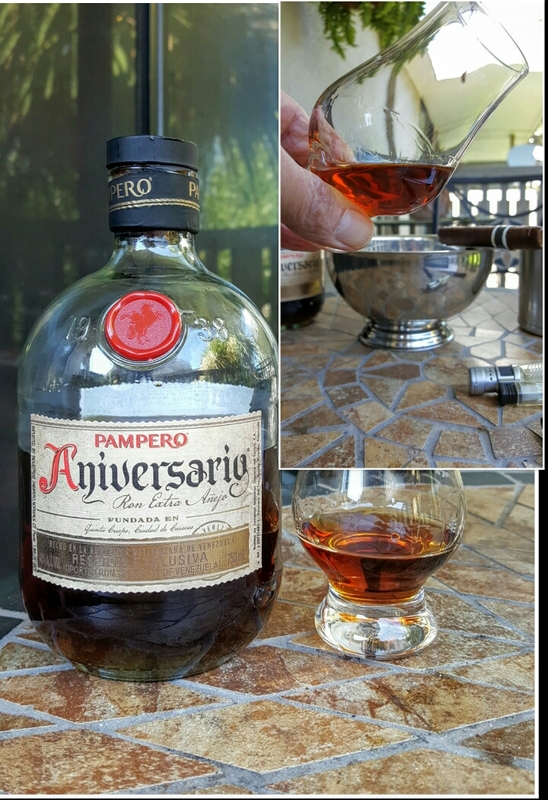 My second rum going back 5 years now as I was only beginning to explore the category and I chose well. Very dark, deeply mahogany red color is very attractive. When swirled in the glass the legs take a long time to appear and then they are very thick, slow, and teardrop shaped. A Venezuelan rum, blended from what I can read about it on the net. There is no age statement on the bottle, but I’m guessing the rums in the blend are reasonably well aged from their color, the lack of strong acetone notes on the nose along with the dark fruit notes, and the dark richness of the flavors. The rum is shipped at 40% ABV. On the nose there is an amazing burst of aroma. First a little alcohol but not overwhelming and only the slightest hints of acetone notes telling me the rum is properly aged. In addition I note dark coffee, tobacco, apricot, pineapple (hint) prune or rasin, brown sugar, and molasses. A heady combination. As it turns out aromas are easier to pick out here than flavors. There are spice-like flavors of cinnamon, burnt caramel, dark fruit, bitter chocolate, tobacco and coffee. The flavors are difficult to tease apart, but the mashup is very satisfying and seems to have a lot in it. There is a little creaminess but not nearly as much as some of my other rums. Like most of the others in this “better product” category there is but a little alcohol, but enough to tell you that it is there. The finish is medium and a little bitter reminding me of charred wood, perhaps from the charred oak bourbon barrels in which the rum is aged. The other rum I’m reminded of here is Old Monk, but this one is better. A similar darkness laced with fruit and spice, but in this case the blend is cleaner and there is less of the add-on spice notes than in the Monk. Sweet, but not very sweet. According to recent sugar tests the Pampero comes out to 12g/l which is only very moderately sugared. Would I buy this rum again? I’ve been through many bottles already and it has remained a consistent rum for me unlike some others which I loved at first and then didn’t. The price is getting up there though. Was around $40 when I first bought it years ago, but now getting into the $45+ range and so competing for my dollar with several other rums I love in that price range like Dos Maderas 5+5 and El Dorado 15, all three being about as expensive as I can go these days. Yes I will buy it again because it is a very good rum, but it will have to wait its turn. Here are links to two other and more detailed reviews.